Michaelson's Appliance Repair, serving the greater Tampa Bay area for over 30 years! "Serving all of Hillsborough, Pinellas, Pasco and Manatee Counties"
Michaelson's Appliance Repair, Inc. - We are continually striving to grow and keep current with today's market trends. As a member of the Professional Servicer Association, United Servicers Association, Marcone's Servicer Association and the Picture Perfect Service Network this gives us the opportunity to keep current with the industry standards, and helps us provide the best possible service. We would also like to take this opportunity to thank everyone who has used or uses our service. We pride ourselves in providing the best possible customer service, to all our customers. We strive to be the best at what we do. All our master technicians are factory trained and have achieved M-CAP certification. They are recognized in the industry as the best of the best. Repairing Washers‎‎, Dryers‎‎, Refrigerators‎‎, Dishwashers‎‎, Wine Coolers‎‎, Ice Machines‎‎, Stoves‎‎, Ranges‎‎, Ovens‎‎, Hobs‎‎, Cooktops‎‎, Cookers‎‎, Grills, Steamers‎‎, Coffee Machines‎‎, Vent Hoods‎‎, Trash Compactors‎‎ and Garbage Disposals‎‎. Also performing some Installations‎‎ and change outs. "We Specialize In High End Products‎‎". Please call for brands not listed. If your Refrigerator / Freezer: Is not turning on - Turns off on it's own - Makes loud or unnatural noises - Ice maker is not working - Freezer side hot - Refrigerator Side Hot - If Both freezer and refrigerator sides are hot - Not cooling as it used to - Compressor has issues - Refrigerator leaking water - Needs service, or any other issues Michaelson’s Appliance Repair Services can help. Refrigerator Repair, Maintenance and Cleaning Tips: If your refrigerator is not running or is not cold enough. ** Important: The above tips are for informational purposes only. For your safety, we strongly recommend any refrigerator repairs to be performed only by a certified technician. For professional service contact us today. You can fill out our easy online service form or in Hillsborough, Pinellas, Pasco call: (813) 935-1919 and Manatee call: 941-870-3110. For professional repair service contact us today. You can fill out our easy online service form or in Hillsborough, Pinellas, Pasco call: (813) 935-1919 and Manatee call: 941-870-3110. 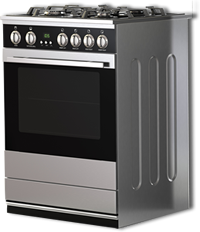 If your Stove / Oven / Range: Not Turning On - Not Holding Temperature as it should - Not Heating up properly - Needs Burners Serviced - Gas Needs new Igniter or Service - Has Broken Knobs - Need Replacement Glass - Displays Error Code: or any other issues Michaelson’s Appliance Repair Services can help. Electric - If your burners are not heating. 1) Make sure they are sitting straight in their proper positions. If your oven is not heating. 1) Make sure the clock is set on manual cycle and not the automatic time bake cycle. Gas - If the top burners are not lighting. 1) Wipe off the burner with a hot, damp rag and then dry completely. If your oven is not heating. 1) Make sure the clock is set on the manual and not the automatic cycle. 2) Raise up the top and keep the area clean and free of grease build-up. 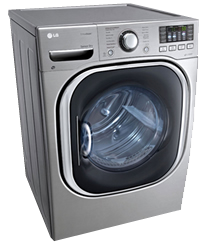 If your Washer: Is not turning on - Stops in the middle of cycle - Is not spinning - Timer is not working - Broken Knobs - Makes loud or unnatural noises - Displays Error Code - Is not agitating - Is not draining water - Needs service, installation or any other issues Michaelson’s Appliance Repair Services can help. 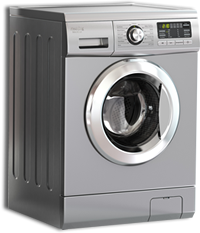 If your Dryer: Is not turning on - Stops in the middle of cycle - Drum is not spinning - Timer is not working - Broken Knobs - Makes loud or unnatural noises - Displays Error Code - Unable to dry a load - Takes 2-3 cycles to dry a load - Needs service, installation or any other issues Michaelson’s Appliance Repair Services can help. 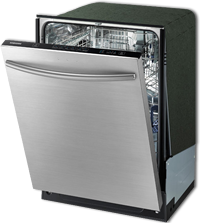 If your Dishwasher: Is not turning on - Stops in the middle of cycle - Is not draining water - Makes loud or unnatural noises - Leaves residue or film on dishes - Displays Error Code - Leaking water - Needs service, installation or any other issues Michaelson’s Appliance Repair Services can help. Make sure the water is hot enough. Water heaters should be set at the dishwashers manufacture specifications. If it is not hot enough, turn electrical power off to water heater, then turn the hot water heater thermostat up to a higher setting. Make sure you are following the proper loading procedures. Use the proper amount of detergent and make sure the detergent is fresh (check expiration or "best if used by" date).